After last night’s thrilling shutout victory over the Edmonton Oilers, the Nashville Predators may have found an offensive tactic that works for them. They may have also found a key to success in their three new players: Zach Boychuk and Bobby Butler, both claimed off waivers this past week and Victor Bartley who they recalled from their AHL affiliate, the Milwaukee Admirals. Before last night, though, the Predators had been struggling. Though it wasn’t a high scoring game, the San Jose Sharks still took the “W” 2-1 over the Nashville Predators on March 2nd. Both of San Jose’s goals came on the power play, one from Dan Boyle and the other from Joe Pavelski. The Predators had defeated the Sharks in their first two meetings this season — 2-1 in a shootout on February 2 in San Jose and 1-0 in overtime at Bridgestone Arena on February 12. The Sharks got on the board first with Boyle’s goal, gaining a 1-0 lead with 2:32 left in the first period. The power-play goal came after a slashing call on Kevin Klein. Boyle wrangled the puck at the Predators’ blue line and took a shot at Pekka Rinne through traffic, who was being screened by Pavelski. During the second period, Nashville’s Ryan Ellis was sent to the penalty box for tripping Andrew Desjardins, giving the Sharks another power play. Logan Couture gained control of the puck behind Rinne’s net, then poked it towards Pavelski. Pavelski then sent the puck past Rinne inside the left post and notched his seventh goal of the season. Gabriel Bourque scored Nashville’s lone goal on a short-handed play in the third period. San Jose rookie d-man Matt Irwin lost the puck in the neutral zone and Bourque manage to grab it. He got a small breakaway on Antti Niemi, faked right, then went left, beating Niemi at 14:30 of the third. Rinne must have been having an off-night. The Predators fell 5-1 to the Los Angeles Kings on March 4th, much to the frustration of coach Barry Trotz. After a no-goal first period, the Predators were eager to find the back of the net. Problem was, the Kings found it first. Nashville’s Craig Smith was sent off for highsticking and Jeff Carter was able to capitalize on the power play with a backhand over Pekka Rinne. The Predators still could not get on the board. Then came the third period that every Predators fan wishes they could erase. Carter notched another for LA at 4:39 with assists from Colin Fraser and Slava Voynov. Moments later the hats came flying as Carter intercepted the puck in the neutral zone from Predators’ defenseman Roman Josi and took it in on a breakaway notching his 14th goal for the season. His second and third goal had only 19 seconds between them. Mike Richards gave the Kings another power play goal at 7:40 of the third, giving Voynov his third assist of the night. Dwight King then got his first of the season four minutes later at 10:54 with a wrist shot past Rinne. Gabriel Bourque scored Nashville’s lone goal for the second consecutive game at 13:05 with assists from captain Shea Weber and alternate Martin Erat. After having only one win their last six games, the Predators were becoming desperate for a win. Coach Barry Trotz made a few adjustments to the team, adding three new faces, and for the most part it seemed to work. 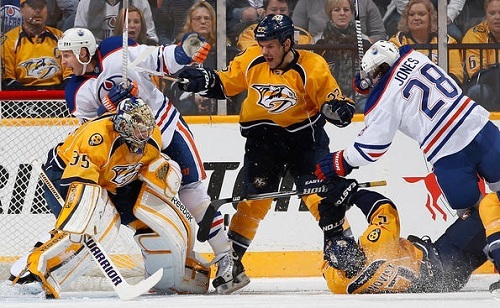 The Preds were playing like they should and it sent them on to a thrilling 6-0 shutout victory over the Edmonton Oilers last night at Bridgestone Arena. NASHVILLE, TN – MARCH 8: Pekka Rinne #35 of the Nashville Predators battles to stop the puck against Ryan Smyth #94 and Ryan Jones #28 of the Edmonton Oilers as Predators Scott Hannan #22 defends during an NHL game at the Bridgestone Arena on March 8, 2013 in Nashville, Tennessee. Colin Wilson notched two goals, which gives him a team-leading seven. He also notched two assists. Captain Shea Weber tallied three assists, while Pekka Rinne had to stop only 24 shots to record his league-leading fourth shutout. The Predators entered the game averaging fewer than two goals per game and had gone 1-5-0 in their previous six. Nashville got off to a fast start, tallying a power-play goal by Patric Hornqvist at 6:07 of the first period, as he swatted in a puck near the crease. The goal was Hornqvist’s third, assisted by Wilson and Mike Fisher. Bobby Butler, making his Predators debut, earned the power play when he drew a slashing call from Nick Schultz at 4:52. He later drew a tripping call on Ryan Whitney at 10:23 of the second period and also drew a roughing call on Ryan Jones. David Legwand made it 2-0 for the Preds after chipping in the puck like he wad going for a line change. The puck took a weird bounce towards Edmonton goalie Devan Dubnyk. He went to grab it with his glove, but it went under his arm and into the net with only 69 seconds remaining in the first. Yann Danis replaced Dubnyk to start the second period and on the first shift, Rich Clune welcomed him by scoring at close range on a pass from Paul Gaustad. Zach Boychuk claimed his first goal with Nashville at 18:22 after deflecting a shot by Weber from the point. The Predators were now up by four. Wilson added Nashville’s final two goals in the third period, one of which was on a power play. “I think the whole team really wanted to respond and especially me, coming to a new team, meeting some new faces you definitely want to show your stuff early,” Boychuk stated, expressing his excitement to have joined Nashville.